Most brain tumours are only diagnosed after the patients start showing symptoms. There are a wide variety of medical examinations to diagnose a brain tumour. Normally, these different examinations are combined with each other. The first step is to perform a neurological exam. The physicist will asses the patient’s symptoms by asking the personal and the family health history. This exam also includes: checking vision, hearing, strength, sensation, balance, coordination, reflexes, mental health and ability to think and remember . Once the doctor suspects the presence of a tumor, the next step would be a scan of the patient’s brain. There are different types of brain scans that may be used. They are useful to confirm intracranial abnormality, characterise the tumor and help to determine grade and make decision about biopsy. 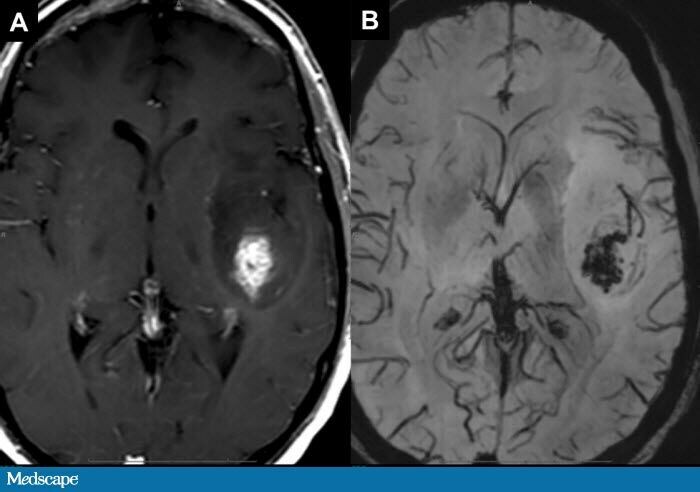 MRI is the best imaging technique to diagnose most types of brain tumour. This imaging technique is based on selective excitation of slices of the patients’ bodies, and then the measurement of the energy emitted by the atoms when they return to a relaxed state. This technique relies mostly on the signals emitted by protons (found in fat and water tissue). The procedure is as follows: the person is placed in a strong and uniform magnetic field (usually 1.5 T) , which causes the protons in the patient to align parallel and antiparallel with the magnetic field and to precess. A radio frequency pulse is applied to the protons, which will cause them to alter their magnetisation. When this disturbing pulse is no longer present, the protons will revert to the equilibrium state, emitting signals that can be measured by the receiving coils of the MRI machine. The difference in these signals (and therefore the difference in the relaxation speed of certain tissue) will give the contrast of the acquired image. Two kinds of relaxations occur in the tissue: spin-lattice relaxation - T1, measuring the proton’s return to the direction of the initial magnetic field - and spin-spin relaxation - T2- measuring the dephasing of the spins of the protons. Gradients in the magnetic field are used to obtain spatial encoding. The final image is reconstructed by 2D Fourier Transformations. As SE Sequences tend to be long, faster techniques have been developed: Inversion Recovery Sequences and Gradient Echo Sequences, when a rephasing gradient is applied(for example Susceptibility Weighted Images, pictured below). This technique can also be used to suppress water (FLAIR) or fat signal. Proton density weighted images: The higher the proton density the higher the intensity. 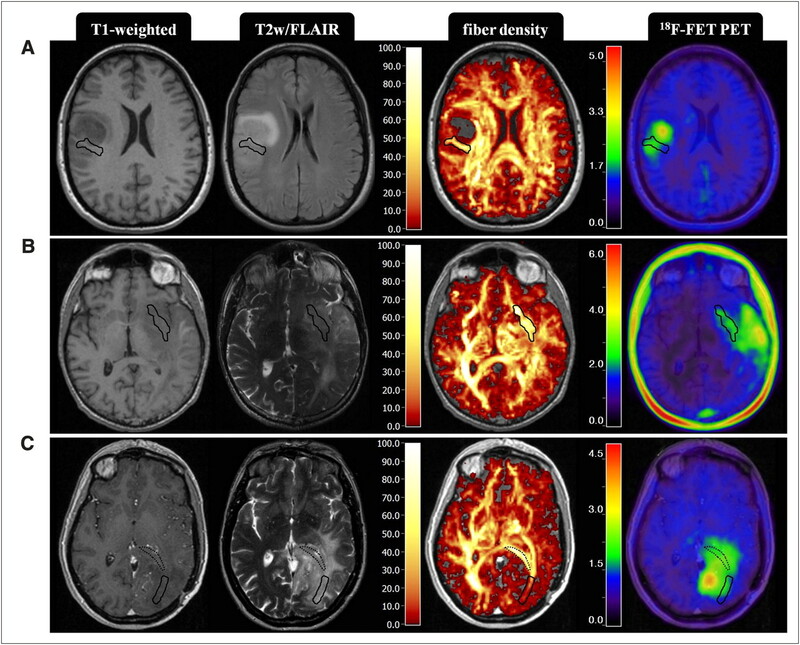 Examples of T1 weighted, T2 weighted and PD weighted MRI scans. Adapted with permission by Kieran Maher using Graphic Converter from [http://homepage.mac.com/kieranmaher/ait/ Applied Imaging Technology] by Heggie, Liddell & Maher (2000). 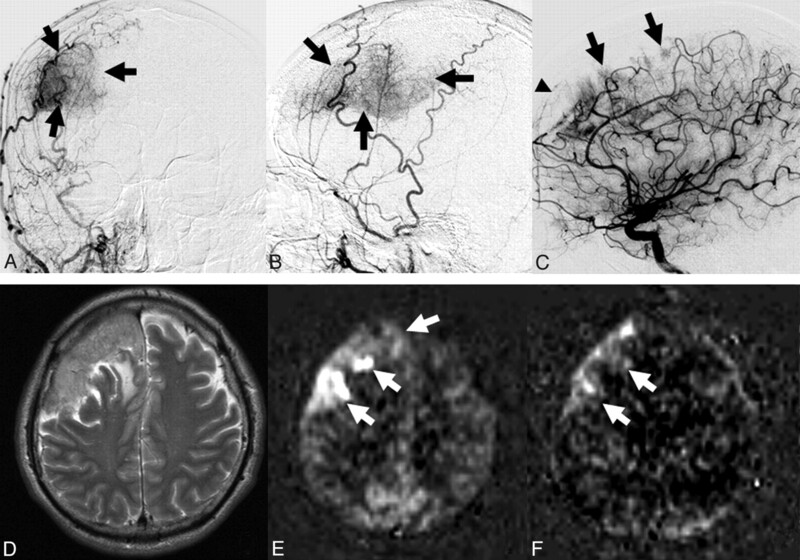 In order to improve the contrast in these images, Contrast Agents can be injected in the patient - the most widely used agent is Gadolinium III, and therefore it is possible to assess areas with higher metabolism. no radiation, very good soft tissue contrast, resulting in more detailed images than in other types of scans. CT Volumes are obtained by having ‘x-ray slices’ of the imaged tissue, measuring the attenuation of X-ray through tissue. Imaging procedure that uses X-Rays and obtains cross-sectional images of the body. An X-Ray tube emits photons that are collimated by a beam-limiting device. Then they enter the patient, whey there can be scattered, absorbed or transmitted without interacting with the tissue. These last photons are collected in a detector. The scattered photons and secondary photons generated by the interaction with the tissue cause a background radiation that may result in noise, therefore an anti-scatter device is placed between the patient and the receptor. Different kinds of tissue have different absorption coefficients, CT images being, basically, a miu-map of the body. Due to the high amount of calcium, bones have a high attenuation coefficient, whereas soft tissue has a lower one, and therefore it’s dark. In a head scan, the skull is white, brain parenchyma grey and the sinuses are black due to the presence of air. A CT scan can help find bleeding and enlargement of the fluid-filled spaces in the brain, called ventricles. 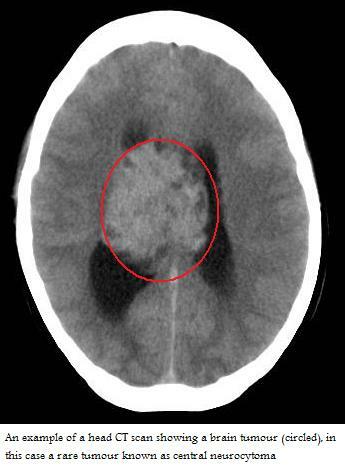 As bones have specifically good contrast in x-ray images, Ct is used to determine changes in the cranial bones, and no distortion in this technique helps measure tumour size. Another situation when a CT is preferred to an MRI is when the patient cannot enter strong magnetic fields, due to a metallic implant or a pace maker. As for MRI, contrast agents can also enhance the pictures obtained by CT scans, dynamic imaging can be performed(with rapid injection of CA) or dual-energy CT scanners can be used . PET(Positron Emission Tomography) is a nuclear imaging technique that assesses the metabolic process of the body. The images are obtained by injecting a gamma-emitting tracer in the human body and measuring the obtained radiation. The concentration of the tracer in the body can be reconstructing using 3D reconstruction techniques. The PET image will still have to be imposed over a regular MRI or CT image, in order to offer location information. The most used tracer for tumor analysis is FDG( fludeoxyglucose ), as it is a “tagged sugar”, and sugar metabolism in tumours is increased. Informations can be obtained about metabolism, blood flow, oxygen consumption, amino acid metabolism, and lipid synthesis in tumours. PET scans are highly used in the evaluation of metastasis(90% of scans). Just like PET, SPECT can be used to obtain functional information about the brain. However, this method is more limited in the localisation of abnormalities. Dual SPECT/CT is often used for simplifying the registration of the images of the two modalities. This information is useful for optimizing diagnosis, therapy monitoring, and radiotherapy treatment planning. Magnetic resonance spectroscopy (MRS) is a test using MRI that provides information on the chemical composition of the brain. Primary brain tumors show elevated choline and decreased NAA (N-acetyl aspartate) levels. A functional MRI (fMRI) is a non-invasive imaging method that provides information about the activity of the brain. During the examination, the patient is asked to carry out certain tasks , and a change in brain activity will result in a slight (1%) change in the MRI signal emitted. During the fMRI examination, the patient is asked to do certain tasks that cause changes in the brain and can be seen on the fMRI image. The reason for this signal is the fact that brain activity changes the level of blood oxygen in the activated areas. Oxygenated blood has a different T2 relaxation time than oxygen-poor blood, resulting in differences in 2 subsequent images, one taken with a stimulus, and one without. (This method is the bases of BOLD fMRI Tests). 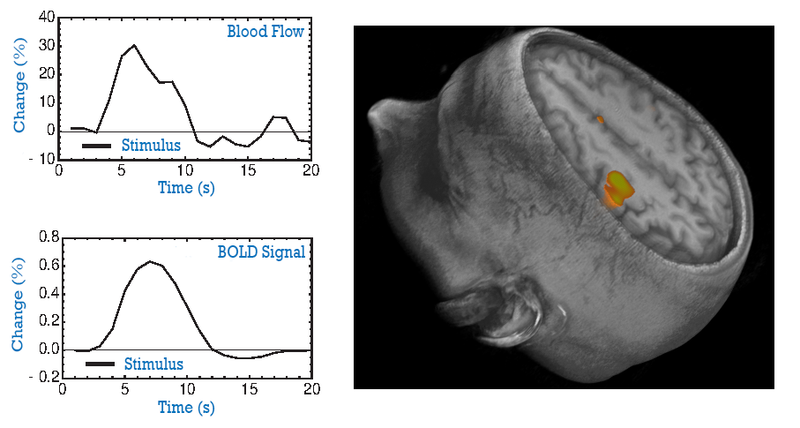 Another fMRI technique is Arterial Spin Labeling (ASL), which works by manipulating the MR signal of the blood delivered to the brain. A control image and an tagged image are then acquired; subtracting these results in an absolute image, caused by the manipulated arterial blood. Tumours can change the blood flow of the brain in ways that are not related to neural activity.This test is used to help plan surgery, so the surgeon can avoid damaging the functional parts of the brain while removing the tumor. 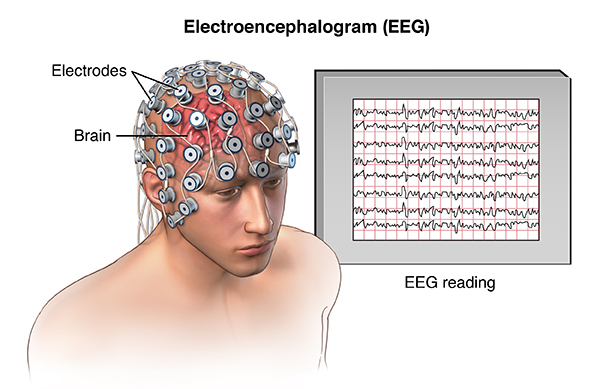 Magnetoencephalography (MEG) is an imaging technique that evaluates brain activity by measuring the extremely small amount of magnetic field (10 femtoTesla) produced by the electric activity. The resulting activity map can then be superimposed with an MRI image. Both these methods use electrodes placed on the patient's head and the measurement of the electric signals of the brain. They can also be used intra-operatively, to monitor the brain during tumour removal. Biological Markers indicate changes in tumour DNA. These tests can give information about tumour type, speed of growth, and help in treatment planning. These biomarkers can be retrieved from blood, plasma, CSF, urine, and saliva. A lumbar puncture in which cerebrospinal fluid, that surrounds and protects the brain and spinal cord, is harvested in tested. Tumour markers can be found in this liquid, in higher amounts than in blood, urine or spinal fluid. Hormone levels in blood and urine can indicate the existence of pituitary and hypothalamic tumours. By assessing the visual field, information about the location of a tumour along the visual pathway can be determined. This test is performed by an ophthalmologist by flashing a series of lights into the patient's eyes and evaluating the response. This is a test in which an audiologist places headphones on the patient's head. Different tones in different sound ranges are directed into the ears of the patient, one ear at a time. This test can help determine whether a hearing loss is caused by tumours (nerve damage) or by eardrum/osccicle damage. DNA profiling, is a blood lab test used to determine the specific features of the patient's DNA,in order to develop the most suitable personalized treatments. When a biopsy is performed,a small amount of tumour tissue is removed( during a surgery or as a separate procedure) and then sent for a pathological review . -Needle Biopsy: A hole is drilled in the skull, and then a hollow needle is inserted. Tumour tissue is removed from the core of the needle and sent for review.